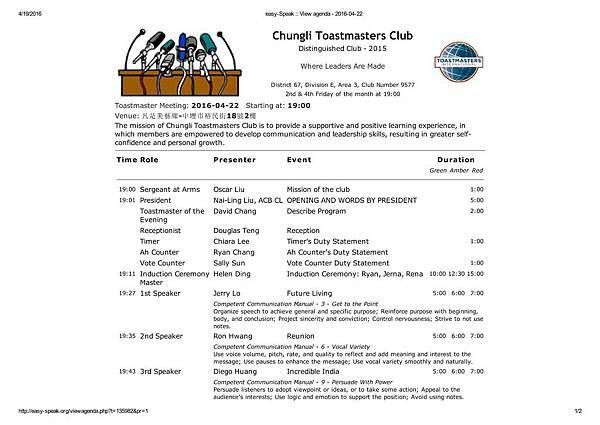 You are invited to join the meeting of Chungli Toastmasters Club on 2016-04-22. Enclosed please find the agenda. three new members: Ryan, Jerna and Rena. It will be hosted by our lovely VPPR Helen. Secondly, we are honored that threechampions will join the meeting. I believe they will definitely win back the trouphies in the Spring Conference. First champion: Div. E speech contest champion Nailing Liu aka the president of our club, she will deliver her champion speech “What makes you happy?” Second champion: A demo speech will be given by the Div. N Speech Contest Champion Alex Jan of Taiwan club, his speech title reads “Moving Forward.” The third champion: Div. E Table Topics Contest Champion Vicky Li from Legend club, she will be one of the evaluators for our member Ron. And one more special guest from sister club, Elmo Chiu of Taoyuan Club will host the Table Topics Session for us. Wow! wow! wow! With this kind of cast, it is definitely worthy of three exclamations. 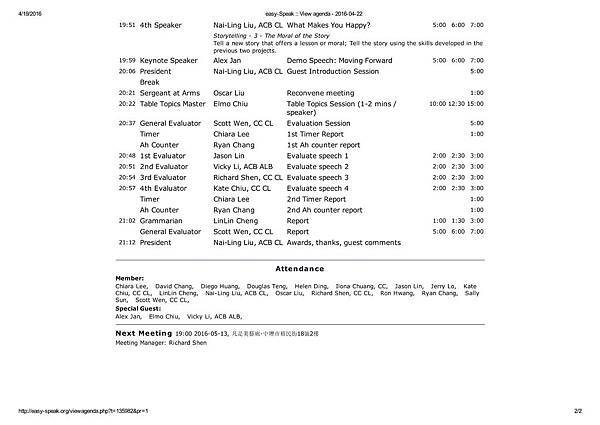 Can’t wait to attend the meeting.